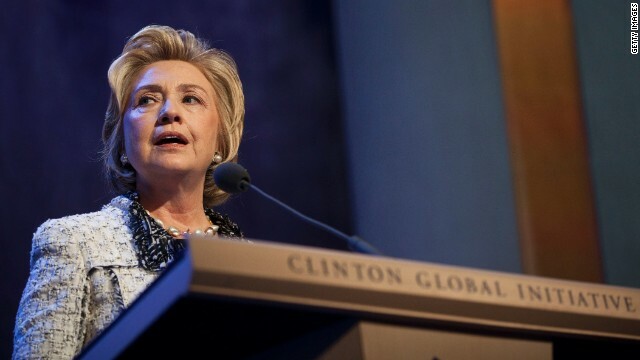 (CNN) - In the ongoing buzz about Hillary Clinton's potential bid for the White House in 2016, the latest talk surrounds a list that her aides created not long after her unsuccessful presidential campaign in 2008. The list, which meticulously details high-profile figures who supported Clinton's campaign as well as those who backed then-foe Barack Obama, was jointly reported by The Hill's Amie Parnes and Politico's Jonathan Allen as part of their upcoming book, "HRC: State Secrets and the Rebirth of Hillary Clinton." According to the report, Democratic lawmakers were given a rating of 1-7 on an early draft of the list, with 1 meaning the lawmaker was considered "helpful", and 7 representing a colleague who was considered "treacherous." America Rising, an anti-Hillary Clinton group, wrote a blog post Monday morning, describing the reported list as a "rejected script" from the Netflix series "House of Cards." In the long 2008 nomination battle between the two senators, the competition for congressional endorsements was a highly-covered topic, with many of the "sevens" making headlines when they threw their support to Obama rather than Clinton. "Old news," one Democratic source supportive of Clinton told CNN, referring to the report. "Time to move on." While it's true many of the endorsements were reported in 2008, the new report details the record-keeping process by remaining members of the Clinton team after Clinton ended her bid for the White House in early June of that year. "I wouldn't, of course, call it an enemies list," one source was quoted saying in the report. "I don't want to make her sound like Nixon in a pantsuit." The group of "sevens" included Clinton's successor at the state department, John Kerry, who was a longtime senator from Massachusetts at the time and a former Democratic presidential nominee. He supported Obama early in 2008. Others on the "seven" list were Sens. Jay Rockefeller, D-West Virginia; Bob Casey, D-Pennsylvania; and Patrick Leahy, D-Vermont. On the House side, Reps. Chris Van Hollen, D-Maryland and Rob Andrews, D- New Jersey were considered "sevens." CNN reached out to each lawmaker's office for comment. "Both during her time as senator and later as Secretary of State I have always said Hillary Clinton was qualified to be President," Leady said in a statement to CNN. "I supported then-Senator Barack Obama because he had opposed the war in Iraq as I had, and I felt he was the person best suited to reintroduce America to the rest of the world." In January 2008, Leahy endorsed Obama on a conference call with reporters, stating that the United States needed "a president who can reintroduce America to the world, actually reintroduce America to ourselves. I believe Barack Obama is the best person to do that." A representative from Rockefeller's office declined to comment on the list. Perhaps the most noteworthy name on the list was the late-Sen. Ted Kennedy, who passed away in 2009. Kennedy famously backed Obama early on in the primary process, saying "It is time again for a new generation of leadership." Van Hollen told Politico Monday that it was a "mystery" to him as to why he got a "seven" rating. The congressman endorsed Obama a day after the then-senator became the presumed nominee by gaining the necessary amount of delegates in June. Van Hollen added he's a "huge supporter of Hillary Clinton." "I hope she will run for president," he continued. The member who drew perhaps the most ire in 2008, however, was Sen. Claire McCaskill, D-Missouri. The Clintons backed McCaskill in 2006 when she was first running for the Senate. That same year, however, she said on "Meet the Press" she considered Bill Clinton a "great leader" but added, "I don't want my daughter near him." McCaskill immediately regretted the comment, the report states, and she asked forgiveness from the Clintons. The relationship seemed somewhat on the mend, but when Hillary Clinton sought McCaskill's endorsement during the presidential cycle, McCaskill sided with Obama. Fast forward to 2013, McCaskill appeared to be back in Hillary Clinton's camp. The Missouri Senator, who won re-election in 2012, became the first member of Congress to officially back the Ready for Hillary PAC, throwing her support to the group last June. The group was started by Hillary Clinton fans last year to encourage the former secretary of state to run for office. It's unknown whether the Clintons have done anything specific with the list since 2008, but it's no secret that Bill Clinton has since frequently campaigned for those who backed his wife. Yet he was also a crucial supporter in Obama's re-election campaign and a high-profile backer of the President's health care reform law. In other signs of change, Clinton and Obama appear to have rekindled their friendship. As Clinton was leaving the state department early last year, he publicly thanked her in a "60 Minutes" interview, saying she'll go down as "one of the finest secretaries of state" and he is "going to miss her." For her part, Clinton said her role as the nation's top diplomat was an "extraordinary opportunity to work with (Obama) as a partner and friend and to do our very best." Kerry has also been highly complimentary of Clinton since he followed in her footsteps and became secretary of state last year. Nice try at trying to divide and conquer CNN, but whoever the democrat nominee is, they'll have 100% support of the democrat party behind them. Whoever the republican nominee is, they can be sure there will be division within their ranks. the democrat party rejected hillary clinton in favor of a person with the qualifications of a dog catcher. and look at the 8 years disaster this clown has brought us. now the democrats think hillary clinton, who has just about the same qualifications as obama the dog catcher, is ready to be president. based on what? because she slpet in the whitehouse before? because she spent 4 years burning jet fuel on a world tour that resulted in zero accomplishments? looks liek the democrats will play the same hand of cards they always play in order to lie and deceive their way to power so their destruction of our country can continue. It sounds more like what a construction worker would call a "punch list". Or what most people might call a "to do" list. It's a list of names that identifies which way people have declared their support for one candidate or another. I would think that any candidate for elected office who didn't keep such a scorecard would be the losing candidate. Pick any two current GOP members. ANY two of your choice...ready? Hillary is more qualified then both combined. Abandon ship! Abandon ship! The S.S. Obama is going down! The Obamacare iceberg has caused critical damage. Must transfer to the Clinton before it is too late. Hopefully people will buy her running on her husband's track record rather than her own. "the latest talk surrounds a list that her aides created not long after her unsuccessful presidential campaign in 2008. " "jointly reported by The Hill's Amie Parnes and Politico's Jonathan Allen as part of their upcoming book, "HRC: State Secrets and the Rebirth of Hillary Clinton." "America Rising, an anti-Hillary Clinton group, wrote a blog post Monday morning"
In other words, here we have another case of "The GOP/Teatrolls write the news...the MSM just reports it." "I have binders full of women." Get over it. There's no "there" there. No action of any kind has been taken against anyone on the lists. I can't stand McCaskill and I'm not a Republican. So now the backstabber wants to support Hillary? Same goes for Pelosi who stabbed her in the back and now says that she's "praying" that Hillary runs in 2016. It's amazing what a pack of self serving rats politicans can be. McCaskill and several others asked the Clintons' for their help when they were running for office. When the time came and Hillary needed their support, they endorsed a guy they barely knew. That goes double for Ted Kennedy. In the 90s Romney went after Teddy's Senate seat and the Clintons came to his rescue. Not only did he endorse Obama, he did it on the morning of Bush's last State of the Union. He knew that millions of people would be watching it on TV and all eyes would be on Hillary. How about Caroline? She had never before endorsed anyone in a Democratic primary (other than family members). Chelsea thought of her as an older sister. Notice how Obama didn't dare appoint her as ambassador until Hillary left her post as SOS. "I would think that any candidate for elected office who didn't keep such a scorecard would be the losing candidate." I'd go even further: I would think that any candidate for elected office who didn't keep such a scorecard wouldn't have become a candidate for elected office in the first place. Understanding where your support and where your potential dangers lie in terms of other powerful people is a prerequisite for being a successful politician and campaign. This is nothing more than conservatives latching onto something and using language about it that they know will draw MSM attention, and the MSM will obediently latch onto the spin they use because it helps manufacture a nontroversy. There's truly nothing to see here though....there's no there, there. @just asking, fair, listen Hillary will be the next woman-president, to back up GOP garbage, fox excrete, in a plain American high school kid language, "you ain't no rich to be repo". Christie is like a piece of toast caught in the toaster, they'd like to save him but nobody is going to stick that fork in there to get him out lest they get electrocuted and as burnt as he is. Hillary, Madame President, 2016 for sure. What more can Hillary give us? Amnesty for ILLEGALS? LGBT rights- nope, already have that stuff! Can she lessen the gap between rich and poor- Nope! Create green energy? Cause a war with China- maybe! What else can she give except create new jobs. She never had a real job in her life, neither did her hubby! So how can Hillary create something of which she has no understanding. Time to get real USA! Elect a republican. I do not like any Democrats or Obama!
" ....was jointly reported by The Hill's Amie Parnes and Politico's Jonathan Allen as part of their upcoming book, "HRC: State Secrets and the Rebirth of Hillary Clinton...."
It never ceases to amaze me how often CNN and others quote from political pundit books when 99.9% of Americans are never interested enough in pundits opinions to read these books to begin with. Why would Americans want to vote repug? They'll only make things worse.